Once you have your new application created using the Universal Theme it's time to customise your theme with Theme Roller. Style: there're two styles that come with APEX 5.0: Blue and Gray. You can start from one of those and see how your application changes color. It will set predefined colors for the different parts of the templates. Color Wheel: when you want to quickly change your colors, an easy way to see different options is by using the Color Wheel. 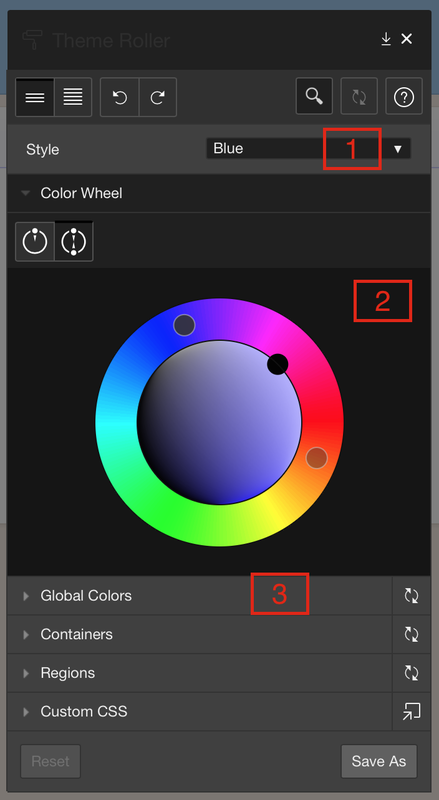 You've two modes: monochroom (2 points) and dual color (3 points - see screenshot). By changing one point it will map the other point to a complementary color. Next you can move the third point to play more with those colors. 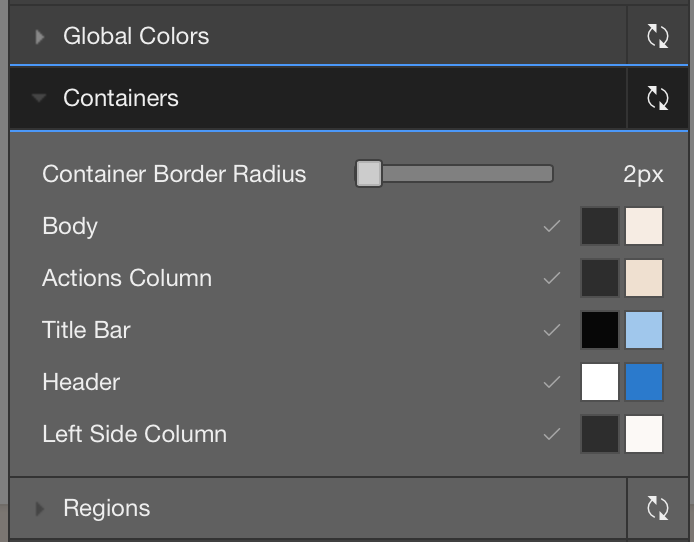 Global Colors: if the Color Wheel is not specific enough for what you need, you can start by customising the Global Colors. 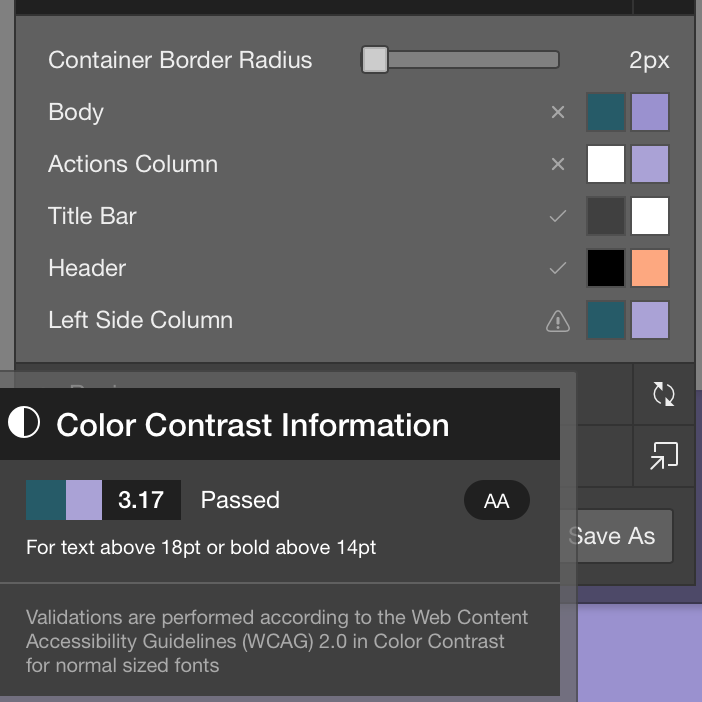 Those are the main colors of the Universal Theme and used to drive the specific components. 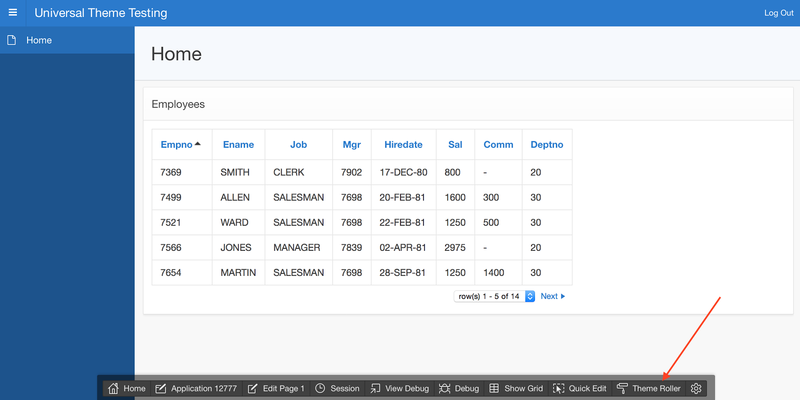 You can still customise the different components e.g. the header by clicking further down in the list (see next screenshot). Containers etc. will allow you to define the specific components. A check icon will say it's the standard color coming with the selected style. An "x" means the color was changed and an "!" means the contrast is probably not great. This is just awesome... but what if you don't like the changes you did? Note that all changes you're making are locally stored on your computer in your browsers cache (HTML5 local storage), so you don't effect other users by playing with the different colors. Finally when you are done editing your color scheme you can hit the Save As button to save all colors to a new Style. When you close Theme Roller the style will go back how it was. The final step to apply the new style so everybody sees that version, is to go to User Interface Details (Shared Components) and set the style to the new one. Note that this blog post is written based on APEX 5.0 EA3, in the final version of APEX 5.0 (or 5.1) you might apply the new style from Theme Roller directly. Want to know more about Theme Roller and the Universal Theme - we're doing an APEX 5.0 UI Training May 12th in the Netherlands. We've got this request from many customers and it has always been a pain to get it working in every condition with APEX 4.x, but no hacking anymore - it's there now in APEX 5.0. When you start to scroll the column header will move up and the content will scroll underneath it. 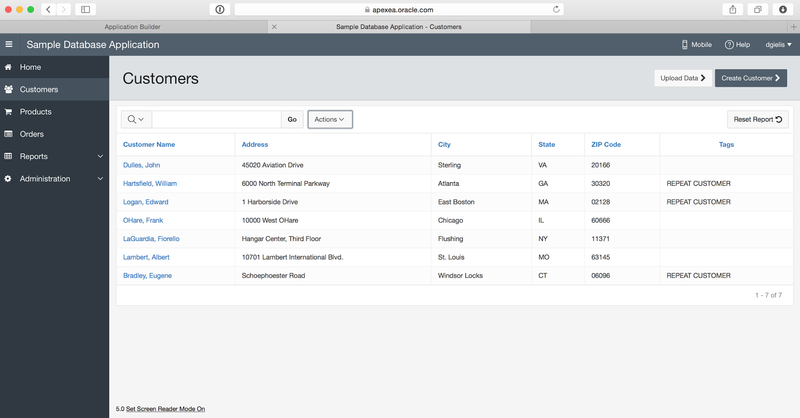 APEX 5.0 EA3 - Universal Theme Styles - Gray! In APEX 5.0 theme 42 is included - this is the Universal Theme. The theme comes with two styles: Blue and Gray. The UI is so much improved in APEX 5, it's really a game changer. When you look at the details for example from such a style you will see it's using a Less file (Less is a CSS pre-processor) behind the scenes. So it's very easy to make changes to the CSS. But you probably even don't need to do that as the development team allows you to make customisations with ThemeRoller which generates JSON (another nice example where JSON is used - interested in JSON - I did some other posts on this blog about JSON). To change the color for example, below you see the JSON for that. Note that Theme Roller will generate the JSON for you. Accept from those customisations, the blue and gray style are using the exact same css. From the Blue style many screenshots have been posted already, but I love the Gray style too, here's a screenshot when you switch the sample application's style to Gray.